Micras, the planet mapped by the MCS. The Micronational Cartography Society (MCS) is an organisation dedicated to creating a unified fictional geography for interested micronations and facilitating social and diplomatic interaction between micronations interested in geofiction. It maintains several maps of the fictional planet Micras and a popular forum. Members of the MCS form the cluster of micronations commonly called the Micras Sector. 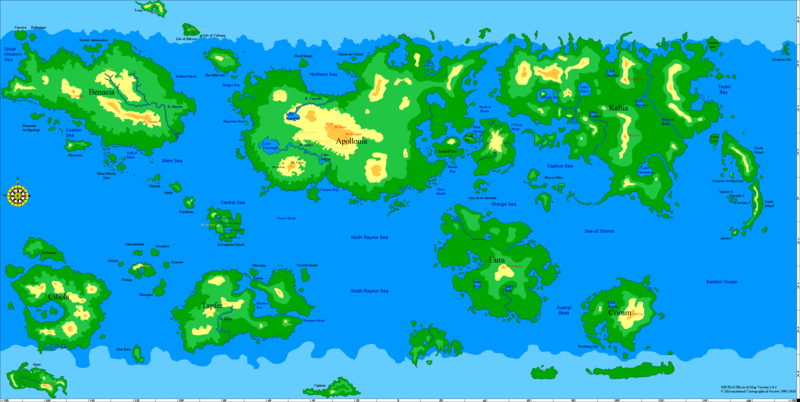 The MCS maintains several maps of Micras, a planet approximately the same size as Earth with seven major continents and a host of smaller islands. Members of the MCS claim territory on Micras in proportion to their population, activity levels, and level of cultural development, which they are then free to populate with cities and provinces as they see fit. Based on their position on Micras, countries acquire opportunities to trade, ally, or fight their neighbors. The most important map maintained by the MCS is the Claims Map, a political map displaying the amount of territory held by each nation. Nations often try to update their Claims Map territory to reflect their current level of power; more successful nations are granted more territory by the MCS Council. The Claims Map is usually updated several times a month, where pending claims demand. The MCS also maintains a Physical Map which displays the names and extent of natural features like rivers, mountains, and seas; a Resource Map, which charts the natural resources deposits of each area, and several Special Maps, which are more advanced and graphics-intensive versions of the regular maps. Although the Special Maps present a more polished and attractive face of Micras, campaigns to make them more prominent have been rejected in keeping with the philosophy that viewing, editing, and updating the MCS map should be within the capabilities of anyone with basic knowledge of MS Paint or a similar basic graphics program. The internal organisation of the MCS is detailed in the Charter, the most recent version of which took effect in December 2010. The Charter details membership of the MCS, establishes a Council of five individuals (plus one non-voting Junior Councillor) which makes most of the MCS's daily decisions, and appoints an Administrator-General with broad executive powers. Members of the MCS are those nations that appear on the MCS Claims Map. To apply for membership, a nation must submit a claim. Eligible nations are those which have existed for at least one month (or younger nations that can establish recognition by a majority of existing members) and usually those which have an active national forum or wiki presence. Membership applications, in the form of claims, are voted upon by the Council. The Council is the main governing body of the MCS. Councillors' portfolios frequently include both cartographic and political duties. For example, one Councillor has traditionally been the Special Cartographer, tasked with making and updating Special Maps, and the Administrator-General currently takes personal responsibility for updating the Claims Map. When a Councillor resigns or is fired for inactivity, the Junior Councillor is promoted to full Councillor, and the Council elects a new Junior Councillor. The Charter provides provisions by which member nations can impeach Councillors or the Administrator-General, but in practice this has never happened. The MCS Council votes on all changes to the map, including territorial claims and reorganisations, although internal modifications are passed automatically. Councillors are ineligible to vote on any claim involving a micronation in which they are a citizen, and votes pass when a majority decision has been reached. The MCS grew from an internal map made by the Union of Apollo States (November–December 2000) as part of its programme to raise money by selling land. When the Union fell apart, two of its successor states—Shireroth and Hyperborea—expanded the map to include their own new territories. 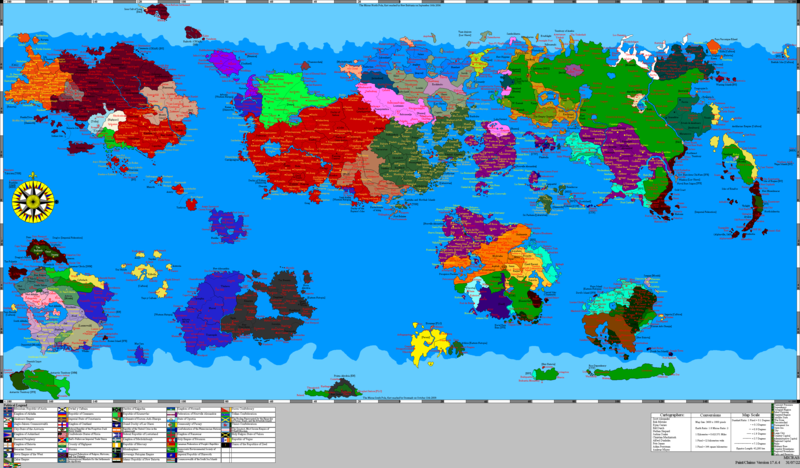 On December 28 2000, Shirerithian Erik Mortis and Hyperborean Scott Alexander founded the Micronational Cartography Society to convince other nations to share the same map and create a unified geofictional simulation. The early MCS included only the western half of the world, lacked internal features like cities and provinces, and was basically a despotism of the two founders. Nevertheless, it quickly grew to include most of the old Apollo Sector, specifically Shireroth, Hyperborea, Jasonia, Machiavellia, Umoja, Tapfer, Treesia and Norfolk. From the beginning, the MCS had a strong commitment to geographic consistency; that is, never changing the physical features of the world itself. But this commitment occasionally lapsed during the early days in the interests of luring new members: for example, when Treesia demanded an island, a peninsula was cut off to create one to their liking. When a half-dozen major micronations merged to create the supernation of Tymaria, the MCS achieved wider global recognition and the interest of larger nations like Babkha and Attera. During this period, the eastern half of the world was filled in by a team including Ras Zhukov of Attera. Erik Mortis switched to an administrative role, helping set up the first MCS forum in Tymaria, later in the small neutral country of Delvenus, and finally on the micronations.net hub; Scott Alexander handled the day-to-day map updates. This arrangement continued successfully until a dispute between warring factions of the micronation of Menelmacar in 2003. Mortis and Alexander tried to evaluate the dispute fairly, but were attacked so heavily by partisans of both sides that they quit in disgust, leaving day-to-day control of the Society to Ryan Caruso. Although the original intent was for Caruso to remain an employee of the two founders, the two gradually retreated far enough in the background that Caruso became the public face of the organisation and was eventually able to seize complete control. Caruso's administration was notable for finally moving the MCS to its own board in early 2006. Other improvements included the society's first dedicated website, the inclusion of an archive system for old maps, and changes to the map itself such as a legend with icons, scales, conversions, and standardised formats. He was also responsible for presenting the first Charter. These improvements helped to make the MCS present a more professional service to the community and strongly improved its membership. However, it was also wracked by controversy; he devoted much of his administration to dealing with the potential for the MCS to run out of claimable land (a problem which never materialised). To this end, he controversially created a new continent and several new islands, violating the geographic consistency principle and making several enemies. He instituted equations to determine the maximum amount of land a country could have, and proposed the "Atkins Reduction" (named after the popular diet) in which each country, especially the largest, would give up a bit of territory to create a large pool of empty territory for new countries to claim; many countries were very reluctant to give up any land and had to be strong-armed into accepting. Despite these controversies, the MCS continued to gain momentum and coverage; Caruso collaborated with the French museum Palais de Tokyo to produce a wall map for an exhibit on micronations and successfully negotiated the inclusion of Danny Wallace's Lovely as a member, both events that greatly increased the amount of influx to the society. In August 2006, a group of disaffected MCS members led by John Darcy of Novasolum founded a competing cartography organisation, the Geographical Standards Organisation. Although they claimed to be seeking a different sort of simulation, MCS politics led many to view it as a deliberate snub against the MCS and an attempt to belittle its members. Ryan, who had been close friends with some GSO partisans before the split, viewed it as a personal insult and considered closing the MCS; he was talked out of this and merely resigned, giving control of the organisation to little-known Antican cartographer V. C. Vehendi. Vehendi's short administration was the beginning of the modern MCS; he established the Council, and improved the Charter. His term also coincided with the absorption of much of the so-called "Lovely Sector"—countries founded by people watching Danny Wallace's "How to Start Your Own Country" show on BBC—into the MCS. During this era, the MCS became self-consciously "nationalist", with people demonstrating pride in the organisation against the rival GSO, which disbanded a few years later. Vehendi quit in mid-2007 and was replaced by Pete James. James remains a controversial figure in MCS history. He kept tight control over the organisation, and annoyed many people with policies, but kept the Society active and successful. His right-hand man was Josh Coales, who took over responsibility for most MCS infrastructure, including its forum, and created important programmes and organisations like the ForumList and Map Archives to help the Society work more efficiently. James' control over the organisation was such that he remained nominally in command long after he became inactive, but eventually transferred control to Cartographer Craitman H. Pellegrino of Craitland; a decision that confounded some observers who had predicted Coales as the next Administrator-General. Pellegrino, who has been Administrator-General since August 2009, has continued many of James' policies and has kept the MCS running smoothly and with less controversy. During his leadership, which can be marked by a greater community involvement in decisions, Pellegrino has overseen the MCS's forum shift to a more inclusive and generalised micronational hub—a move which has seen a large influx of nations from the MicroWiki Sector—whilst allowing the Council more transparency by making voting procedures visible to the public, introducing simpler means for nations to modify their existing land claims, and reducing the minimum age eligibility for newly-founded nations to claim on Micras. Most recwars also take place on ad hoc MCS subforums, and are preserved in the MCS Archives.